Put strap in first loop counterclockwise. Put extender button in jeans hole, with upward motion. Loop strap around and choose tighter or looser snap setting. 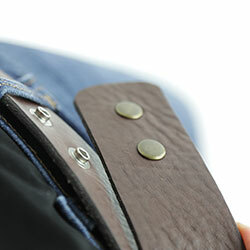 "This belt has saved me on many occasions last minute when I couldn’t fit into jeans that I thought fit. Thank you Lynn Taylor!" "The cost savings and mileage I get out of my jeans and pants is great. It doesn't matter if I go up or down a few pounds, I can still wear my favorite pairs." "I hated not being able to wear my favorite jeans, but they were just too tight to button after having my baby. Once I got my Lynn Taylor belt, I was in them every day again! And no one knew the difference. " 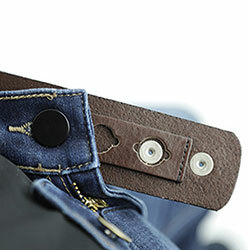 With this brand new belt extender, you are no longer limited by the one buttonhole your jeans come with. 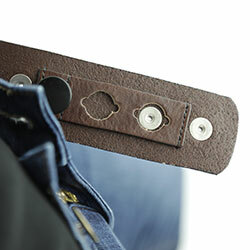 Now you have the option of expanding the waist size of your jeans by buttoning your jeans to this belt. You can instantly wear your favorite jeans again! Completely secure and absolutely gorgeous! Still wishing your jeans fit? Here's a secret—if you want your jeans to fit, you have to do something different. 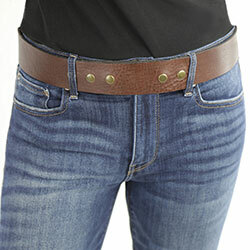 With the Lynn Taylor® Belt, you can fit into jeans up to one size too small. Just fill in your name and email to claim your discount!